Saddle | The How-To Repository for the Cigar Box Guitar Movement! The saddle is a piece of material that either rests on top of the bridge, or is built into it. Traditionally on acoustic gutiars saddles are made of bone, but on cigar box guitars they can be made from a range of other materials including metals (brass, stainless steel, aluminum, etc), wood, corian, plastic and more. The saddle and the nut form the two parts on the instrument where the strings touch, and the distance between them determines the scale length of the instrument. In some cases, such as when you use a simple bridge such as a threaded rod, that piece serves as both the bridge and the saddle. 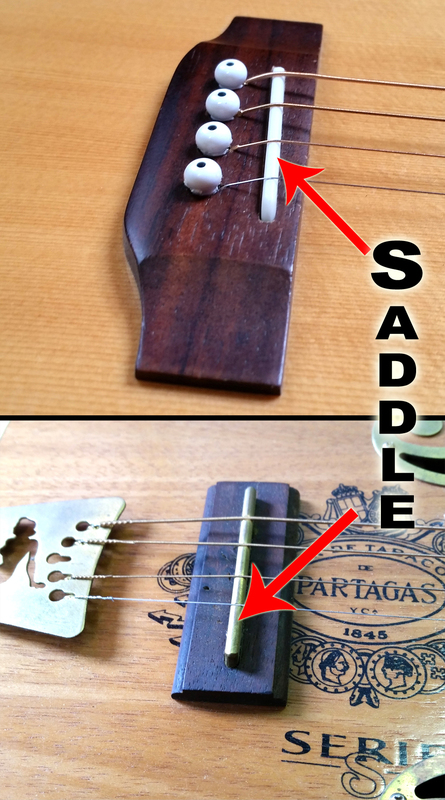 The top photo shows what a saddle on a traditional tenor guitar bridge looks like. The strings are held in place by bridge pins, and go up and over the bone saddle. The bottom photo shows a bridge/saddle arrangement on a cigar box guitar, where the saddle is a piece of brass bar stock set into a piece of Peruvian walnut. A saddle may have a rod piezo pickup under it, allowing the guitar to be amplified.